Grade.us is a customer review management platform that was founded in 2013. It allows businesses to create a landing page, populated with a variety of review opportunities for the specific platform that a customer prefers. For example, if they want to leave a review using their Google account, they can; or they can choose to use Facebook or Yelp if they prefer. Grade.us refers to this set up as creating a “review funnel”, and through this arrangement, businesses can make it very easy to direct customers to as many options as possible to capture more reviews. 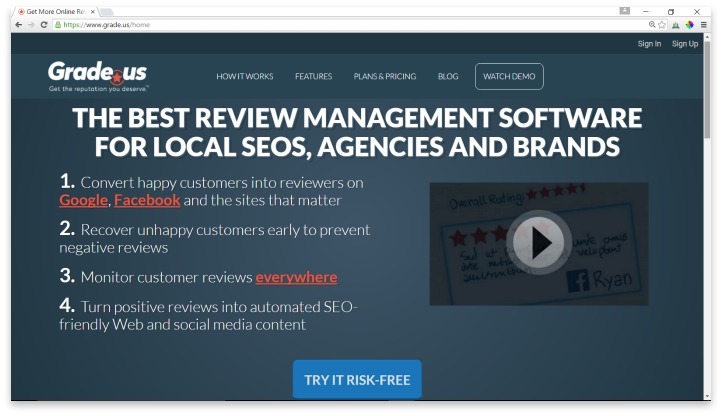 The software also includes a streaming widget that shows 4-star and 5-star reviews to any customer who visits the business’ website, or any profile where they have the widget installed. Grade.us has an interesting setup that does a great job of taking care of the most commonly cited excuse for not leaving a review: it was too much trouble. In any email or communication with clients, users of Grade.us can send a single link that leads to a company profile page on Grade.us. This page offers customers a quick one-click portal to any review service they prefer, from a list of over 35 options. They simply click, review, and are done. If their review is negative, Grade.us will even connect them to a page where businesses can connect and attempt to address the issue. The streaming service is similar to many other review display services: a simple code that creates a widget on any page, showing the most positive reviews gathered through the Grade.us portal. It’s not customizable, and not the most modern in appearance, but it can help convince potential customers to give your service or product a try. Grade.us starts with a limited subscription at $70 per month, or the full service subscription at $250 per month. Enterprises that need to manage more than 25 brands or product lines must contact Grade.us directly for a quote. There is a free trial that users can sign up for to try the service out. The landing page that users create for their service doesn’t require any technical knowledge. Everything can be set up in just a few minutes through the website’s step-by-step process, and the landing page is mobile-friendly for all customers. Adding the link to your own website results in a subtle footer, which you can remove if you like. You can also integrate your landing page with Google Analytics for more reporting. The only real concerns with the service are the inability to customize the landing page buttons, which are simple and quite large; and the lack of any real customer service resources online. There is no Help page that users can go to for basic Dos and Don’ts. But with such a simple service that doesn’t offer or require many bells and whistles, this isn’t a major concern. Grade.us is a customer review management platform that allows businesses to create a landing page, populated with a variety of review opportunities for the specific platform that a customer prefers (Google account, Facebook or Yelp). If your business or product is listed or featured on a lot of different platforms, and you need the fastest way to share review links with your customers, a landing page like the one that Grade.us offers is a great idea. Within just two or three clicks, your customers can be brought to their preferred resource for reviewing. Grade.us is perfect for users who don’t have a lot of technical knowledge, or who want something that is easy and fast to set up. However, if you have the ability to create your own web pages, it wouldn’t take much to design your own custom page, and even create a widget that streams certain reviews. Have you had an experience with this company? Please share your Grade.us reviews below.